WASHINGTON (CNS) — As members of the National Park Service observe the organization’s centennial in 2016, they affectionately recall one of their most celebrated guests of honor — Pope Francis. In addition to awe-inspiring parks such as the Grand Canyon, Yosemite and Glacier, some of the United States’ most iconic sites also are a part of the National Park Service, including the White House and Independence Hall, both of which were on the pope’s itinerary during his 2015 U.S. apostolic journey. Pope Francis was the third consecutive pope to visit the White House. 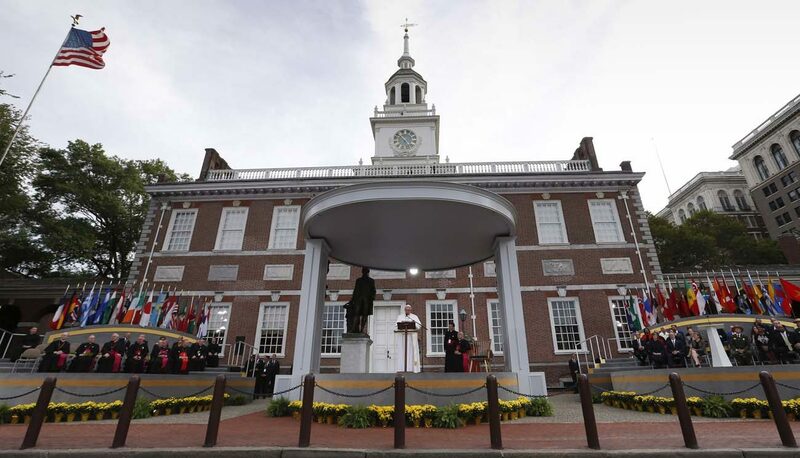 However, it was the pope’s visit to Independence Hall in Philadelphia that became a symbolic centerpiece of U.S. trip. Pope Francis wanted to visit the building because it played such a key role in the founding of the United States and its storied democratic experiment. It’s also the site where he delivered one of his most memorable speeches on religious freedom and welcoming the stranger. Franklin Vaca, a native of Ecuador living in Minnesota who traveled cross-country to see Pope Francis in Philadelphia, told Catholic News Service that seeing the Holy Father speaking in front of the iconic symbol of American freedom touched him at his core. The optics couldn’t have been better for the leader of the Catholic Church to speak about personal freedoms and religious liberty in front of the building where the Declaration of Independence was signed in 1776, creating a nation built on those principals, said John Jarvis, director of the Park Service. Independence Hall was built in 1732 and originally housed all three branches of Pennsylvania’s colonial government. It later served as a meeting place for the Second Continental Congress and is the spot where both the Declaration of Independence and the U.S. Constitution were debated and signed. Before addressing the audience, Pope Francis went inside the building to see where the American founding fathers constructed their plans for what would become the United States, she said. As a Catholic, Kupper said she was thrilled to meet the Holy Father in that setting. What pleased her most, however, was the enthusiastic response from her non-Catholic colleagues during their time with the pope. “He transcends Catholicism,” she said.